Stereo Chorus + Pitch Mudulator & Flanger Mint NEW ! For more than 25 years the TC SCF (Stereo Chorus + Pitch Modulator & Flanger) pedal has been the favorite choice of professional musicians. Though originally intended for use with guitars, many keyboard-players have adapted the SCF in their setup – especially to give the extra “touch” on Rhodes electric pianos. Technically way ahead of its time, with the incredible dynamic range and lack of noise, the SCF is still in this new millennium a top selling product and a “must have” for many. 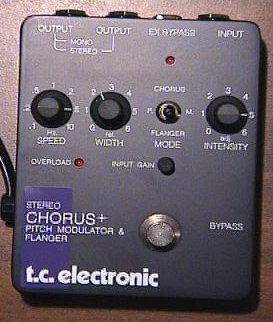 The TC Electronic Stereo Chorus / Flanger has been seen in pedal boards for more than 25 years now. TC Electronic is renowned for their quality effects and the SCF is no exception. The TC Stereo Chorus / Flanger gives you super high quality Chorus, Flange, and Vibrato all in one pedal. The TC SCF also features a bypass jack that allows you to control the effect bypass from a remote location. With this many features packed into one box, the TC Stereo Chorus / Flanger stays on top of the heap of quality guitar effects and TC Electronic once again keeps their reputation intact. The TC Stereo Chorus / Flanger sounds like a high dollar studio processor. The TC SCF features a wide, linear frequency response (20-20K) to ensure the effect stays transparent and you get the full effect from the deepest bass note to the highest harmonics. The TC Chorus is thick and lush with just basic controls to keep everything simple. The Flange is huge and jetty and can be tamed down to a mild roar. The Vibrato effect is very cool. The Intensity knob actually controls the balance between Vibrato and Chorus in this mode to give you a wet signal with angelic tones. Any other modulation pedal on the market has their work cut out for them keeping up with the TC Stereo Chorus. Built in a rugged metal box with 110-220V operation, the TC Electronic Stereo Chorus / Flanger will take anything the road can throw at it, and you can still plug it in when you tour Japan!